Fido and Friend in Five: Dori Butler and Mouse! It goes without saying, I'm a total sucker for a good dog story. So when I stumbled upon Dori Hillestad Butler's adorable early reader series, The Buddy Files, I was delighted! These funny, charming books feature a lovable Golden Retriever named Buddy who's gone from shelter dog to super-sleuthing therapy dog. In the first book of the series, The Case of the Lost Boy (which won an Edgar Award), Buddy is adopted by a loving new family after mysteriously losing his old one. In the newest, fifth book in the series, The Case of the Library Monster, Buddy discovers a blue-tongued creature in the public library where kids read to him. What is this terrible, blue-tongued monster? Buddy's on the case! Dori is one of those authors who must never sleep (unlike yours truly) because she writes all kinds of books! 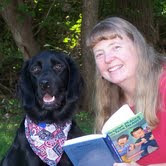 Not only does she write the Buddy series, she also writes novels for middle graders, teens, and nonfiction. And on top of that, she and her sweet Mouse are a therapy team. So let's meet this dynamic duo! 1. How did you and Mouse find each other? 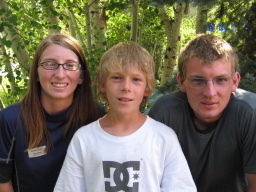 In the fall of 2008, I found out my older son would be moving half way across the country. While I was happy for him, I was kind of bummed for myself. I also realized it wasn't going to be long before my younger son would move out too, and I need something new in my life to make up for this impending empty nest. I'd read lots of articles about therapy dogs, so I decided the new thing I'd get involved in was therapy dog work. Unfortunately, my 14-year-old, arthritic, timid cocker spaniel was not a candidate, so I started checking PetFinder www.petfinder.com every day. Specifically, I was looking for a Golden Retriever (even though any breed can be a therapy dog). One day, I came across a listing for "Mowgli", a black GR mix, who they said "never met a person or animal he didn't like." I had a feeling this was my dog. The shelter brought him to our house so he and they could meet all the two-footed and four-footed residents. Mowgli was HUGE in person--way bigger than I expected him to be! But he was SO nice, so friendly and seemed smart and easy to train. He and Molly (our other dog) liked each other, my kids fell in love with him, and my husband didn't say no--so I said yes! We changed his name because Mowgli was too close to Molly. What better name for a 100-pound dog than Mouse! It's a great conversation starter when we enter a new therapy situation. Mouse and I mostly do the R.E.A.D. program in libraries, so kids can come in and read to him. We're also going to participate in a camp this summer for special needs kids. 2. What makes Mouse's tail wag? When I come home. When I get ice from the freezer (he knows I'll always toss a cube to him). When I grab a Kong Wubba for a game of tug. When I say any of the "magic words": walk, outside, play, dog park, or treat. 3. What's your all-time favorite dog story? Shiloh. It's probably the book I've reread the most as an adult. 4. If Mouse could change just one thing about you, what would that be? That I would never leave the house without him. 5. In five words, tell us what Mouse means to you: Enthusiastic, unconditional, tail-wagging LOVE! Daddy was born in Selma, Alabama the son of a car mechanic and housewife. His father, my Grandpa Bill, got as far as the 8th grade before he had to work to help out his family; Bess, my grandmother, had to leave school in 6th grade for the same reason. My father was their only child and the first in the family to graduate from high school. He was a pilot at the tail-end of World War II, and then became an airline pilot. That's how he met my mother, who was a stewardess. They fell head-over-heels in love, started a family and he became an air traffic controller so he wouldn't have to be away from us. That's the kind of Daddy he was. He made pancakes and bacon on Sunday mornings, told us stories about what all our stuffed animals and dolls had done during the night to keep him awake. Once our canary (who was quite ill-tempered) escaped his cage. I remember he sat up in the huge oak tree in our backyard all night with Tweetie's cage and a flashlight, calling him. And wouldn't you know, the bird came back! He loved animals and art and his girls--my mother, my sister, and me. On the rare occasions we had a hard freeze in Florida, he'd run the sprinklers all night so my sister and I would wake up to a sparkling, frozen fairy land. When I was six and a half, he and three other men in our neighborhood were carpooling home from work at the airport. It was a foggy night. They were all looking forward to getting home from their families. They were all killed by a drunk driver, including Daddy. Four young families were devastate in every sense of the word. The drunk driver broke his nose and his kneecap. 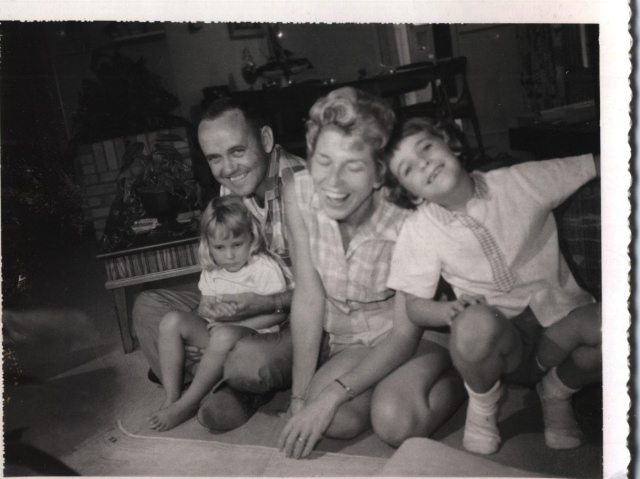 Nine very difficult years later, John Cox, my stepfather, came into our lives. The thing about John was, he never tried to replace my father. He knew how much we all (including my mother) missed him, even nine years later, what kind of man my father had been. He gave us all a safe, stable place to be ourselves. I will be the first to say, I was not the easiest kid to live with! I resented having to share my mother with him. I tested him and refused to call him "my stepfather" for years. I referred to him as "my mother's husband." But John never pushed. He respected me and gave me lots and lots of room. Most importantly, he healed my mother. He made her happy in a way my sister and I simply could not. This would be something I would come to greatly appreciate several years later after I went away to college. One of my best memories is coming home from college on break and just hanging out with John and my mother in the living room at night, listening to them talk. I was enveloped in a sense of safety. Years later, John and I kept vigil together as my mother lay dying, in a coma, in the hospital. I'll never forget him saying to me, "I know your father was the love of her life. I just felt honored to have know Bill Pyron through your mother. She's been the love of my life." John has been my role model of being a step-parent when I was lucky enough to marry into kids. I don't know that I've done as good a job as he did with us, but I try. I'm very, very proud to say with a great deal of respect and love that he's my stepfather. The other "dad" in my life is my husband, Todd. When Todd and I met twelve years ago, I'd been single for ten years. During that time, I'd actually made a point of not getting involved with men who had children. But Todd was different. I always tell people, I first fell in love with the father Todd was to his children and then with the man. I mean, this is a guy who saved all of his children's baby teeth! When he showed them to me, I just melted inside. He was a card-carrying Girl Scout den mother, a soccer mom, and his kid's best friend. He sewed their Halloween costumes. His kids were and still are his greatest passion in life. An empty nest has not been entirely comfortable for him! He loves me dearly, I know. But his kids are the core of his being and the light of his life. And that's the way it should be. He's never happier when the kids are here at the house. Yes, I know it sounds Freudian and all that crap, but he is the kind of father I know my father would have been if he'd lived. So I send this tribute with great love and respect to all the dads--living and not, biological and otherwise--that made us who we are. Happy Father's Day, Daddy, John, and Todd. Fido and Friend in Five: Gareth Crocker and Jack! 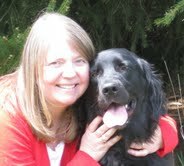 So this a first for Fido and Friend: an interview with an author in a different hemisphere! 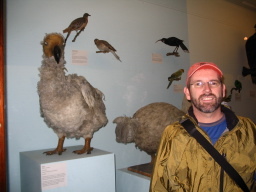 The author in the spotlight today is Gareth Crocker, who lives in Johannesburg, South Africa. That means that while I write this in Park City, Utah it's the next day where Gareth is. Cool! I first heard about Gareth and his adult novel, Finding Jack, from one of my librarian buds. I'd emailed her to tell her how much I loved A Dog's Purpose and she said, "Now you need to read Finding Jack!" So I did. What a wonderful story about the healing power of love! Set in Vietnam, Finding Jack is the story of the unbreakable bond between a soldier, Fletcher, and his "army issued" dog, Jack. After several successful operations together, Fletcher arrives back to base and learns that a cease fire has been declared. This initially wonderful news is followed by the devastating news that all U.S. dogs serving in the war have been declared "surplus military equipment" and will be either destroyed or left to fend for themselves. 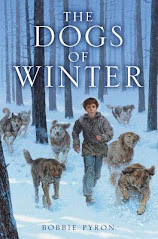 This story, based on actual events, asks the question: when the war is over, how do you leave your best friend behind? This is really a gripping read. 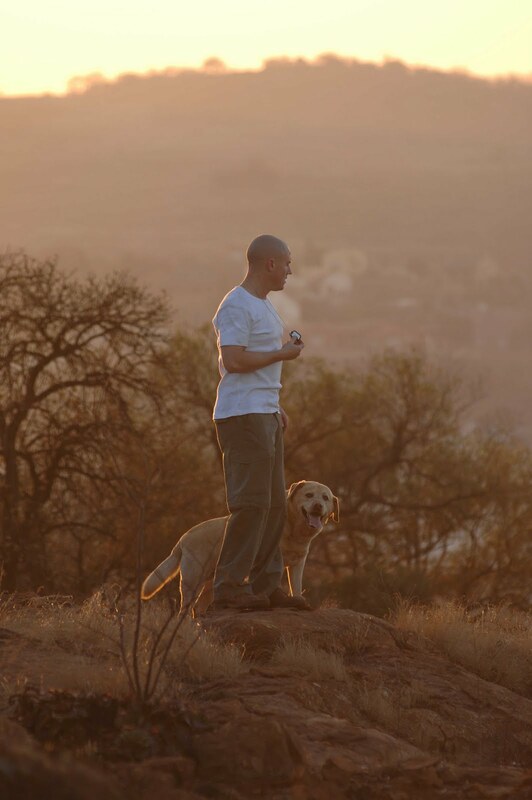 Gareth lives in Johannesburg with his wife, two children, four dogs (one named Jack), and two cats. He's worked as journalist, copywriter, news editor, PR manager, and spokesperson for a multinational corporation. He's even made a film! As he says on his website, he writes at night by the light of the moon. Although I'm really hoping Gareth's busy at work on a new novel, I appreciate his taking the time to visit us with his bud, Jack. 2. What's your all-time favorite dog story? 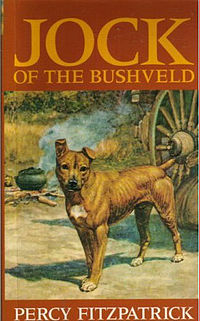 Jock of the Bushveld--a real heart warmer. Followed closely by Finding Jack, of course. And to watch a wonderful book trailer for FINDING JACK, visit www.youtube.com/watch?v=078S46VLJBo It's short but very compelling and will tug at your heartstrings. 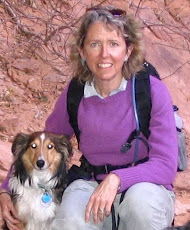 Fido and Friend in Five: Suzanne Selfors and Skylos! I was working at the library one day, and we got in this middle grade book with the cutest cover and an even cuter title: Smells Like Dog. Dog on the cover and the word dog in the title, you betcha I grabbed that book and took it home to read. What a hoot! Laugh-out-loud funny, a bit of a mystery with such a great narrative voice. I was in heaven. So imagine my delight at the very end where their was a photo of the author holding her dog--and the dog was a gorgeous Sheltie! 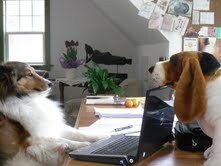 I emailed Suzanne "toot sweet" and asked her if she and her Sheltie would like to be on my blog. I was so, so happy when she said yes! I love all the dogs who've been on Fido and Friend, but it's really special to me to have a Sheltie since I'm all about Shelties. One of the other really cool things about Suzanne is she writes for all ages. Her middle-grade books, Smells Like Dog and it's sequel Smells Like Treasure, To Catch a Mermaid, and Fortune's Magic Farm have been called "darkly comic." 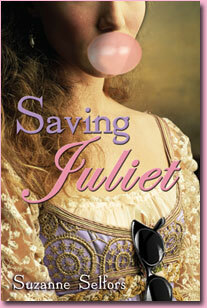 She also has written a number of teen novels including Mad Love and Saving Juliet, all of which are award winning. Suzanne's a busy lady, but she is, most importantly, Skylos's girl. 1. How did you and Skylos find each other? Skylos is the first dog I purchased from a breeder. All my other dogs came to me as strays. He is my first Sheltie. My husband read all these articles about choosing a puppy from a litter--different games to play with the puppy to make sure the puppy wouldn't be too timid or aggressive. Skylos is absolutely perfect, I must say. He's friendly and gets along with other dogs. Because he's a herding dog, he's very loyal and stays by my side. The only bad thing he ever did was to eat our kitchen floor when he was a puppy. His name means "dog" in Greek. My son named him. 2. What make's Skylos's tail wag? Saying "Wanna go for a walk?" or "Wanna go see Casey?" She's his girlfriend. 3. What's your all-time favorite dog story? I love the picture book series, McDuff, by Rosemary Wells about the little Westie (West Highland Terrier) and his adventures. I used to read those books to my kids when they were little. I adore the illustrations too. I like happy dog stories. I also love the picture book, Dogzilla, by Dave Pinkey. Very funny! 4. If Skylos could change one thing about you, what would it be? He'd make me love his scent. Oh yeah, two weeks without a bath and he smells like a bag of rancid cornchips. It's all that fur--layer upon layer of it. Soe he gets lots of baths, which he hates. 5. In five words, tell us what Skylos means to you: My everpresent, understanding, calming muse. I just LOVE getting these photos and emails from fans of A Dog's Way Home! This one came to me from South Carolina by way of a fellow librarian in Salt Lake City. I just love the totally absorbed expression on Kellie's face, don't you? That's the way every author hopes their readers will look! minute. Kellie reads until she goes to bed & then picks it back up as soon as she's finished getting ready for school. She says that you need to tell Ms. Bobbie that she needs to write a series about Tam. I haven't asked for any details of the story since I want to read it too!" Fido and Friend in FIve: Cheryl Rainfield and Petal! One of the many blessings of being an author is the good company you keep. I mean seriously, there's just not a nicer group of people than authors who write for kids and teens! I'm very lucky to have two things in common (at least) with the amazing Cheryl Rainfield. One is we both have teen books published by WestSide Books. In case you're not familiar with WestSide www.westside-books.com, they are a newer publisher that pretty much just publishes contemporary, realistic teen fiction. 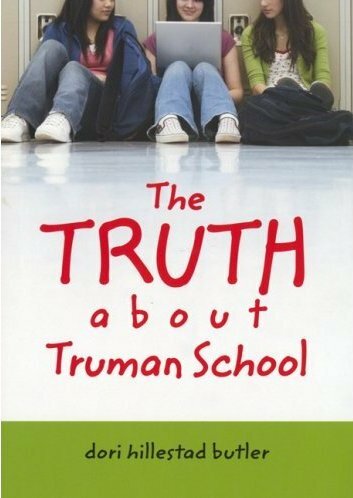 These are books that reflect the real world teens live in. 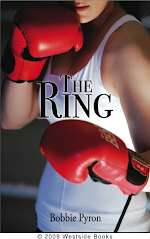 My first book, The Ring, was published by WestSide in 2009 on one of their early lists. With authors like Cheryl, WestSide is becoming a force in the publishing world. Cheryl's debut novel, Scars, has really put WestSide on the map. It's won several awards and appeared on many "top" lists like ALA's Top 10 Quick Picks. Scars explores sensitively and compassionately the issue of cutting. It's a book that's won her legions of fans for its honesty and bravery; for some teens its been a life saver. 1. How did you and Petal find each other? 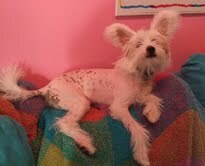 Some time after my beloved Willow (also a Chinese Crested) died of congestive heart failure, I searched for another Chinese Crested because I loved Willow so much, and I found Petal--looking so happy and playful and cute! I actually had her flown in from another province (Cheryl and Petal live in Canada), and we bonded right away! She brings me happiness and love. 2. What makes Petal's tail wag? Having me come home (along with much licking of my face,jumping on me, climbing all over me; she's just so happy to see me!) and sometimes just me talking to her. 3. What's your all-time favorite dog story? 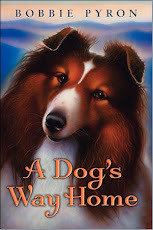 I have a few--I can't pick just one: MCDUFF MOVES IN, by Rosemary Wells, HARRY THE DIRTY DOG, by Gene Zion, and SUPERDOG: the heart of a hero, by Caralyn Buehner. 4. If Petal could change just one thing about you, what would it be? To have me worry less and play with her all day, and go on more walks. 5. In five words, tell us what Petal means to you: Unconditional love, family, furry child. 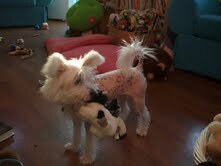 Thanks so much, Cheryl and Petal, for visiting Fido and Friend in Five! To find out more about Cheryl, be sure to visit her website and blog at www.cherylrainfield.com She's got all kinds of cool stuff on her website for readers and writers alike. And keep on eye on her: she's got a new book coming out in October called Hunted. 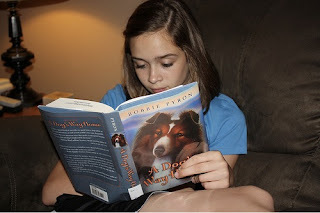 Last week, I posted a fan letter I got from a young girl and her father who are reading my book, A DOG'S WAY HOME, together. I said that connecting with the reader is why I write. Letters like that are a great reminder when sometimes it seems like the whole business end of publishing consumes me. One of the things I'm really proud of with this book is that it seems to connect with readers of all ages! Even though it's technically a "kid's book" I've gotten many emails from adults who've have read it and were touched by it. The other day, I was delighted to receive this email from Betty. Her email means a lot to me, in part because she is also a Sheltie mom. Betty has two rescued shelties who are the light of her life. I thought I'd share her email. 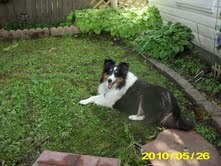 She was also wonderful enough to send me a photo of one of her adopted Shelties, Rosie. Enjoy! I'm not sure who it was that mentioned your book "A Dog's Way Home" to me, but maybe I just found it on Amazon. Whatever, I am SO glad to have bought it as it was very hard to put down. I am NOT a young person - in fact I'm 77 years old - but I love Shelties and right now we have two female tri-color Shelties, Rosie and Hannah, who came from the Central Illinois Sheltie Rescue in Bloomington, IL. They are numbers 4 and 5 from there, (we had Aladdin and Misty) but we had two even before that (Lance and Pixie). The star on Tam's forehead on the book's cover is almost identical to the one on my Rosie!!! Shelties are definitely the best dogs in the world! This is a most amazing book and even though you wrote it for younger children, I totally enjoyed it. 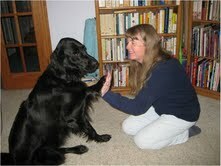 I'm passing it on to my grandchildren, who also love dogs and all have at least one living with them! Thank you so much for the great story. Tam and Abby have won a place in my heart. I would love to read more about them, perhaps how Tam recovered and maybe how they got to meet all the people who had helped him, and of course if he was able to run and win another agility trial. I'd be first in line for that book!!! Fido and Friend in Five: Sheila Nielson and Furry, Feathered Friends! A few weeks ago, there was an article in USA Today declaring that mermaids are the next hot thing in books. Goodbye blood-sucking, humorless undead and hello beautiful singing sirens of the deep. HOORAY! I love mermaids. As a matter of fact, I told my parents when I was about four or five years old that I wanted to be a mermaid when I grew up. I spent a heck of a lot of time in our bathtub trying to grow a tail. "How'd that work out for ya?" you might ask. Not so great. 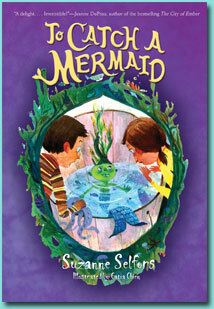 But I have never lost my love for mermaids and neither has Utah author (and fellow librarian, I might add), Sheila Nielson. Her debut teen novel, Forbidden Sea, grew from a life-long fascination with these magical beings. The other really cool thing about Sheila is she's also an illustrator, jewelry maker, and doll collector. Sheila is also an animal lover. She shares her life with her tiny toy poodle and her 11-year-old parrot. Sheila's parrot talks, dances, and loves to play peek-a-boo! 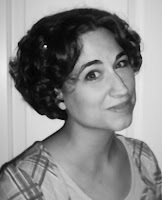 A local author, a fellow librarian, a lover of mermaids and dogs? It was a no-brainer I'd ask Sheila to be in the Fido and Friend spotlight! 1. How did you and your little poodle find each other? 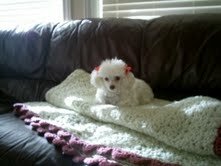 I'd been wanting to buy a tiny toy poodle for a very long time, but hunting down a good breeder was quite a trick. One day, I picked up one of those free "Thrifty Nickel" want ad papers and discovered a breeder who had just what I wanted. When I went to pick up my puppy, I met my dog's mother AND grandmother, who really liked me a lot! They were jumping all over me and licking my face--very cute. The owner was so impressed by how well I bonded with her two older dogs, she begged me to take her favorite puppy from the litter. My dog was indeed a special little sweetheart and the breeder didn't want her to go to just anyone. I'm so lucky I was lucky enough to get her! 2. What makes you dog's tail wag? Bacon, chicken, and that high-pitched baby talk voice everyone uses when they first see how tiny and adorable she is. She knows that is her special voice. 3. What's your all-time favorite dog story? Bark George, by Jules Feiffer. I like reading it to groups of preschool children at the library. They just love it! 4. If your dog could change just one thing about you, what would it be? She would like me to offer bacon on the menu more often than I do. She'd also like to sleep under the covers with me every night, but she's too small. I'm afraid I might roll over on her while I'm sleeping! 5. In five words, tell us what your dog means to you: Best friend in the world! Thanks so much, Sheila and friends, for being in the Fido and Friend spotlight! 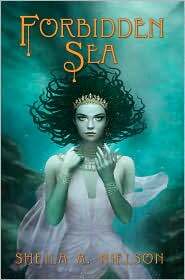 If you are looking for a good mermaid tale, be sure to check out FORBIDDEN SEA. Fingers, paws, and fins crossed for a sequel!